Join the Latin America Working Group (LAWG) as an Advocacy Intern and assist with our efforts to promote a human rights-based approach to U.S. policy towards Latin America. You will gain an understanding of politics, economics, social issues, and human rights in Latin America; exposure to how the federal government works and how foreign policy is made; experience working in a professional environment through the lens of a D.C.-based nonprofit; and skills in online grassroots political organizing. Hear directly from past interns through testimonials at the bottom of the page. LAWG summer 2018 interns at our rally and press briefing against family separation. Specific tasks include, but are not limited to, assisting in research and writing of blog posts and other literature, attending meetings and congressional hearings, posting to social media, and assisting staff with daily and long-term projects. Interns work closely with staff on all four campaigns, doing what is necessary as it arises. The internship includes some administrative tasks, but leans more heavily to programmatic ones. The office is fast paced, but staff are friendly and approachable. Internships are unpaid but are eligible for a $10/day travel stipend and academic credit. Interns are encouraged to work a minimum of three days or 20 hours per week. 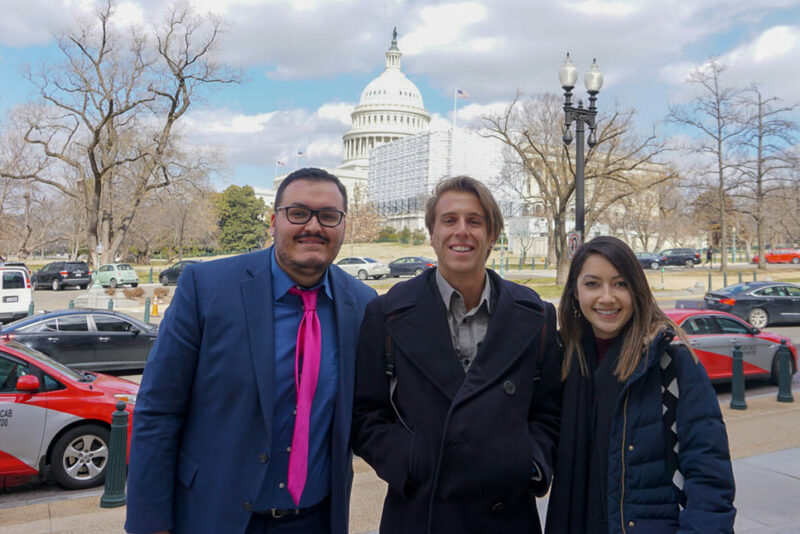 LAWG spring 2019 interns with intern coordinator, Lily, after a LAWG co-sponsored congressional briefing on TPS, DED, and DACA. All documents should be uploaded in a single pdf. 2-3 pages maximum (can be excerpt) in English that focuses on a relevant topic (Latin America, U.S. policy towards Latin America, human rights issues, advocacy). It can be an academic paper, blog post, or news article. Optional: writing sample in Spanish with the same qualifications as above. Complete applications should be imputed into our online application form before the deadline. Interning for LAWG was a fantastic experience for me. I came to LAWG as a history major with a concentration in Latin America, and with some knowledge of human rights violations committed routinely by Mexican security forces, widespread impunity, and collusion between government officials and organized crime. LAWG’s internship enabled me to focus on these issues as some of the many root causes of northbound migration to the United States, and helped me gain insight about building more humanitarian immigration policies by connecting grassroots networks to legislators in Washington. LAWG’s advocacy and education projects exposed me to a number of channels for political organizing on migrant and human rights in the Americas: State Department meetings; reports based on interviews with migrant shelters, rights groups, and other regional partners; and social media activism. When I started my internship at LAWG, I was hoping to gain a deeper understanding of current U.S. policy toward Cuba, Central America, and Mexico, and how NGOs are working to address the shortcomings/injustices of those policies. I also wanted to get acquainted with the world of human rights advocacy in D.C. I can truly say that my summer at LAWG gave me both of those things and more. Curating LAWG’s social media accounts had me constantly reading news articles and reports on Latin American affairs, which contributed hugely to my understanding of both the human rights situation in there and the policy decisions surrounding it. Helping with action alerts, petitions, and dear colleague letters to Congress introduced me to some of the specific strategies that NGOs use to influence policy. Writing a blog about US-Cuba relations helped guide my further learning and research on Cuba, as well as hone my language to be more specific to advocacy. LAWG also gave me access to a wealth of interesting panels, events, and lectures around D.C. featuring politicians, advocates, and journalists from all over the Americas and the political spectrum. Getting to hear so many perspectives on Latin American politics was a huge contributor to my personal learning. And perhaps best of all, I got to work alongside and observe the amazing ladies of LAWG, who were always so willing to include me in projects, answer my questions, and listen to my input. Overall, I learned so much about the region as a whole, and I feel better prepared to defend my own views and contribute to Latin America/US policy work in the future.